Provide comfort for the family of Marguerite McKay with a meaningful gesture of sympathy. Passed away peacefully at Credit Valley Hospital on Friday, April 05, 2019. 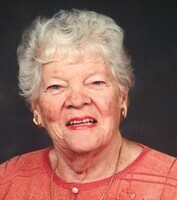 Beloved wife of the late Donald McKay (1995). Loving Mother of Donna (Bruce Whitaker) and Son Brian (Sharon). Devoted Grandmother of Laura, Mark and Katie. Marguerite will be sadly missed by her extended family and friends, She was born in Mimico and lived for over 60 years at the family home on Koos Road. She had a long and wonderful life. There will be a private family service and interment. A celebration of Life will be held Friday May 03, 2019 at the Markland Woods Golf Club (245 Markland Drive; Etobicoke, ON. M9C 1R1) from 12:00 – 4:00 PM. In lieu of flowers donations to Heart & Stroke Foundation would be appreciated. Beautiful lady, wonderful mother, grandmother and friend. She will be missed. My aunt Marg was a wonderful person, I spent countless hours at the McKay household, eating many wonderful lunches and dinners, my aunt Marg loved to cook. She loved family and loved friend, most of all she loved to laugh and god how I could make her laugh. She will be missed in body but not in spirit, I will always have her in the happiness of my memories.